As described in bit more than six years of prior posts, one has a certain fascination with those things which others ignore. The history of NYC can literally be found right there beneath your feet, especially once you learn how to read the signs and sigils left behind by earlier generations. 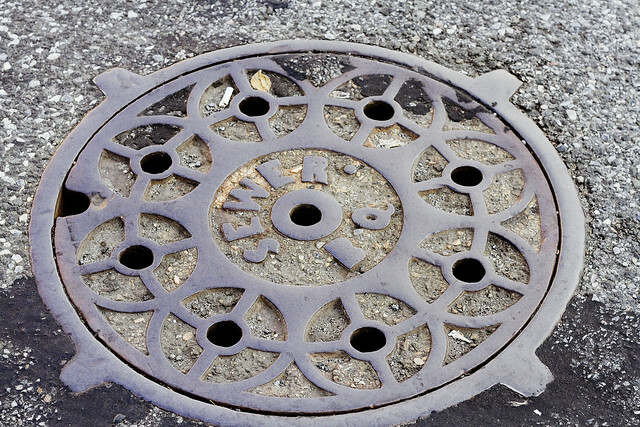 Access, or Manhole covers, are everywhere. Research has shown that Federal Roadway regulations state a preference for State and Local governments to either replace an access cover with an exact copy from the original foundry, or just leave the old one in place. This means, since most of these things were put in place before the World Wars of the early 20th century, that there are iron or steel discs adorning the “via publica” which can tell the tale of Municpal organization, consolidation, dissolution, and indeed gentrification scattered about. Pictured above, an access cover put in place by the Bureau of Sewers, Borough of Queens found in Astoria. Over in Blissville, also in Queens, an access cover which once belonged to the New York & Queens Electric Light & Power Company, which is one of the consolidated parts of Consolidated Edison. NY&Q EL&Pco. was created in 1900, and quickly bought up most of the smaller players in electrical generation and supply in western Queens. Most of NY&Q EL&Pco.’s common stock was actually held by the Consolidated Gas Company of New York. In 1918, the NY&Q EL&Pco. merged with the Edison Electric Illuminating Company of Brooklyn. The new entity merged with the Edison company of Brooklyn, Inc. Eventually, after decades of this sort of merger and acquisitions nonsense, you get to Con Ed. On it. The circles, I am told, are standard indicators that electrical equipment will be found below. 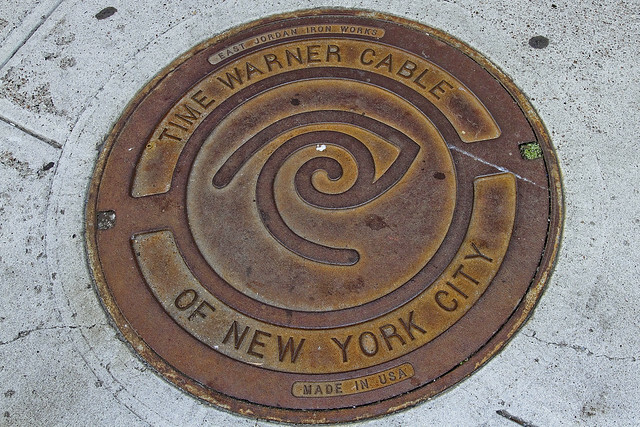 An odd one spotted on West 24th street in Manhattan, which quite obviously belongs to everybody’s favorite corporation – Time Warner Cable. It bears their modern logo, and is quite interesting as there aren’t thousands of wires splayed through the trees and bending utility poles, which is that squamous corporation’s tell tale calling sign is in Queens and Brooklyn. I guess the City people don’t want their blocks all cluttered up so the wires are in the ground where they belong. 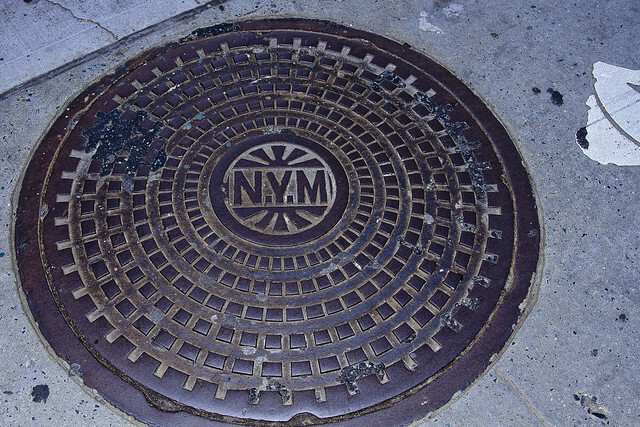 Over in Queens Plaza, sometime between 1912 and 1923, this NYM cover was placed. The New York Municipal Railway Corporation was formed in pursuance of contract 4 of the dual contracts era of the New York City Subway construction era, and was originally connected to the Brooklyn Rapid Transit (BRT) company. In 1923, NYM merged with the New York Consolidated Railroad and formed the New York Rapid Transit Company. It also stopped working on “BRT” or Brooklyn Rapid Transit and instead got busy on the “BMT” or Brooklyn Manhattan Transit situation. The BMT became the New York City Board of Transportation’s problem in 1940. 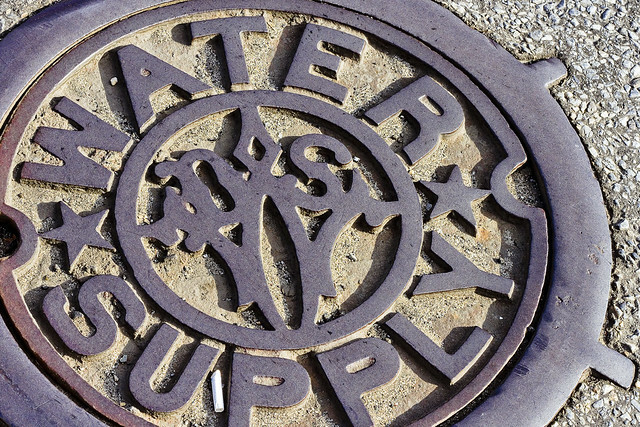 A precursor agency of the modern DEP was the Department of Water Supply. The DEP was formed in 1983, incidentally, combining several independent bureaucracies into one massive agency which handles the delivery of potable water to the City, the operations and maintenance of the storm water and sanitary sewers, and a bunch of stuff that doesn’t involve getting wet – like noise complaints, air issues, chemical spills, and those sorts of things. DEP also spends a lot of effort figuring out ways to obscure what they’re doing from the reckoning eyes of regulators and citizens. The DEP accounts for something close to a third of NYC’s budget, has a navy, operates courts and police departments in upstate New York on Resovoir lands, and ultimately reports to a Robert Moses style “Authority” and the Mayor of New York City. The Water Board Authority, whose board is composed of political appointees (The DEP Commisioner plus 4 mayoral and 2 gubernatorial appointments), can borrow a theoretically unlimited amount of money in your name – doesn’t have to tell you who they borrowed it from – and will raise your water rates to pay the interest. They are the permanent government. Kafka would recognize the DEP. Another “Authority” who can borrow freely in your name, once upon a time the New York City Transit Authority was known as “Rapid Transit New York City” and that was when this smallish “RTS NYC” hatch cover was embedded in the pavement. The particular specimen pictured above is found on Broadway somewhere near the hazy borders of Jackson Heights and Woodside in the 60’s. The City’s RTC NYC purchased the BMT and IRT in 1940, and in June of 1953, the New York State Legislature created the New York City Transit Authority to rescue the nearly bankrupted agency. In 1968, NYCTA was folded into the State’s new Metropolitan Transportation Authority, along with LIRR and twelve other counties worth of rail and bus operations. That’s how, long story short, MTA became New York City Transit’s parent agency. We were once a plain spoken people, we New Yorkers. Once upon a time it was simply the “N.Y.C. 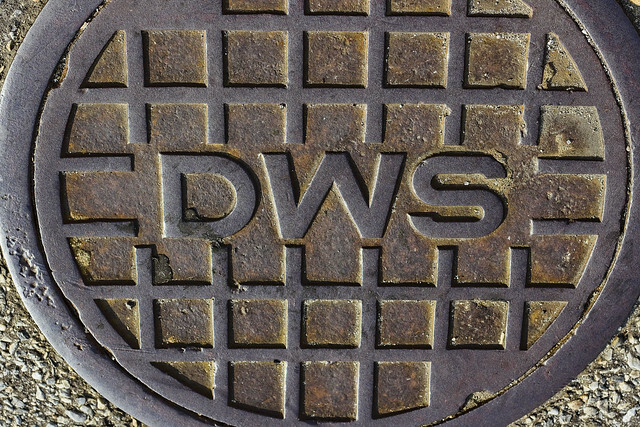 SEWER” department. Today, it’s a division of DEP called “Bureau of Water and Sewer Operations.” Guess it sounds better on your resume when trying to pick up a lucrative Singaporean consulting gig after you’ve done your 25. 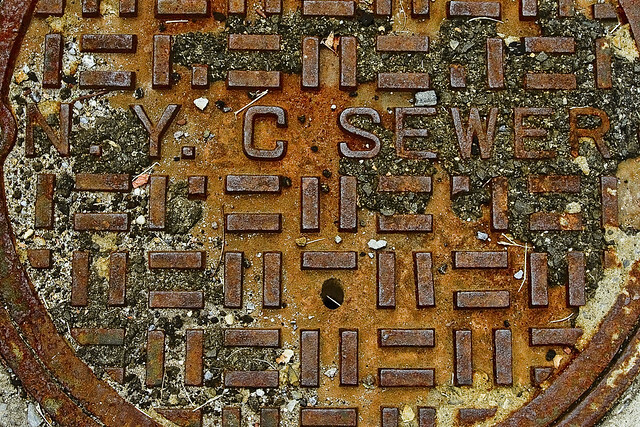 NYC has a fairly archaic system, sewer wise. It was state of the art back when Germany had a Kaiser, but the combined sewer system has major drawbacks in our modern time. A quarter inch of rain translates into a billion gallons of water, citywide, moving through the system. Since our sanitary and storm sewers feed into the same pipes, the mixed flow of liquid happiness is far greater than our sewer plants can handle all at once and it gets released directly into area waterways – like my beloved Newtown Creek. The access cover pictured above sports six sided bits on its face (hexagons), which indicates there’s some sort of telephone infrastructure under it. Mysterious, to me, is the titanic amount of force and weight required to break one of these cast iron things on Astoria’s Broadway near the 46th street station of the R and M lines. Famously, a 1950’s nuclear test (Operation Plumbob) launched a manhole cover, which resided on a shaft near the blast site, at six times the velocity which would be required to escape Earth’s gravity. The discus was never recovered. 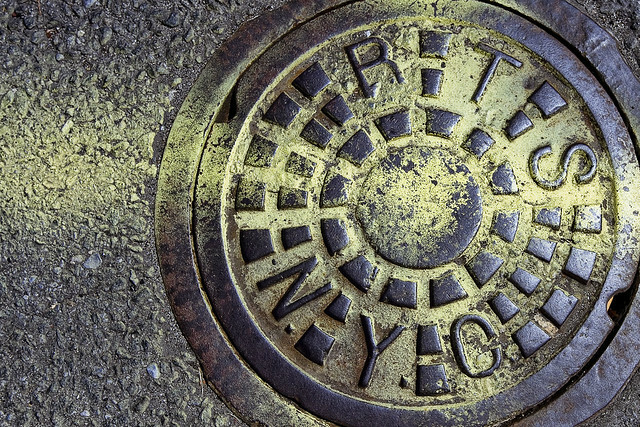 At the end of it all, there will be rats, roaches, and manhole covers. You see these all over Long Island City, and they are my favorites. My understanding of the process involved in creating one of these designs is that it’s a pretty straight forward sculptural one. A carving is made which serves as the “positive” for molds. The molds then have molten metal poured into them, creating a casting. The red hot casting is cooled, and undergoes a finishing round of polishing and grinding. The reason that so many of these access covers are as ancient as they are is that foundries generally discard positives and molds after the order has been fulfilled. Most of these foundries aren’t even in existence anymore, either. You don’t meet many blacksmiths or forge stokers in Bushwick or Williamsburg these days, not even artisanal ones. As stated at the start of this post, the federal highway people prefer for the original cover to stay in place, or be replaced with an exact duplicate. Sans the original mold, that ain’t gonna happen. Personhole covers are great pieces of art. I just received an out of print addition of Manhole Covers by Mimi and Robert Melnick with pictures from around the country. 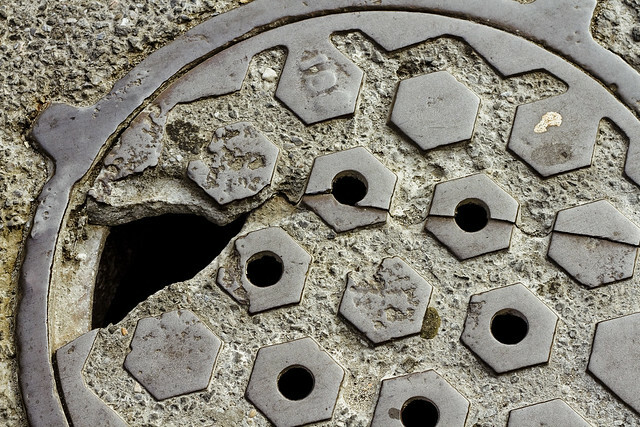 It is divided by Utility, Sewer and Drain, Vents and Grates, Maintenance and handhold covers. 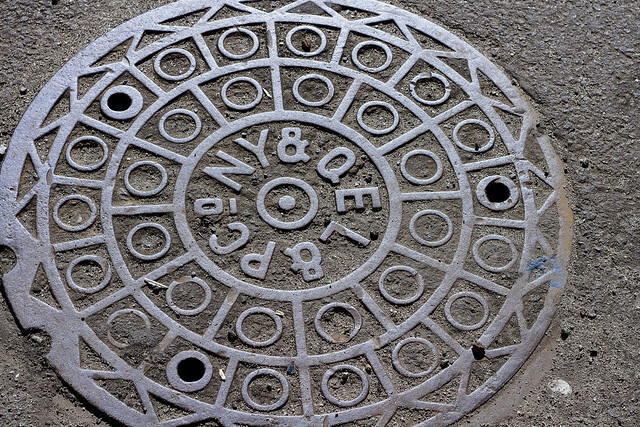 lot of NYC manhole covers say “Made in India”. What gives there?